FINALLY VEGETARIANS CAN HAVE SOMETHING SLIMY TOO! So, if you’ve been reading for any length of time you know that Jay hates all mushrooms except for oyster mushrooms. He says I spend too much on purses, and I’m like THEY’RE ALL THE SAME STOP BEING SNOOTY. But also I love mushrooms and if this is the only kind I can get it’s not…a dealbreaker, you know? Not at all. Jay also loves oysters and, if I’m being honest, I can eat maybe 2 before I’m totally done. I like the flavor, don’t mind the slime, but I have a fear of seafood grit aka dirt aka sand in my food. If I get one teensy gritty feeling between my teeth I am DONE for the entire meal. I have no clue how to avoid grit in seafood. I buy it at good places, I clean it how I think you’re supposed to. Mussels to me are the worst offenders. What am I missing? So, we made Oysters Rockafeller, but with a big hunk of local mushrooms we found. 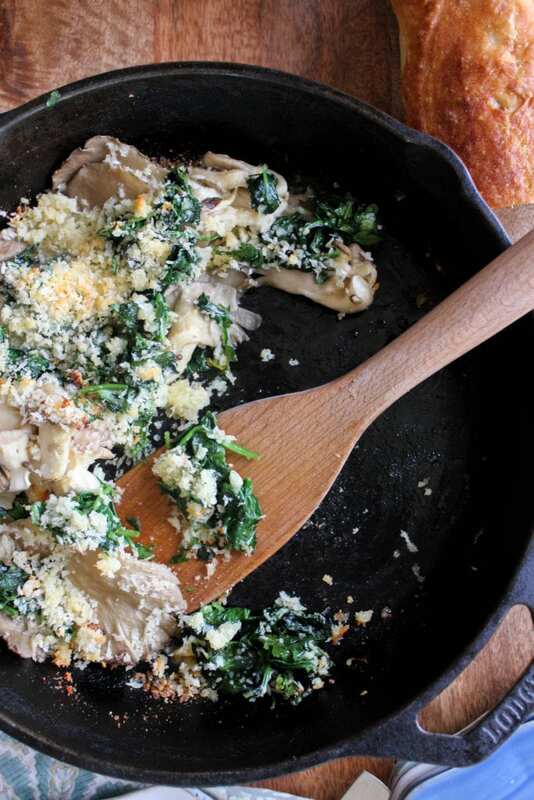 They’re pretty classic – butter, spinach, parsley, garlic, bread crumbs and parm. The mushrooms get roasted the in the drippings from the garlic (garlic butter, guys, garlic butter), and it’s a side dish, salad, appetizer (over bread duh), or lunch. You pick! 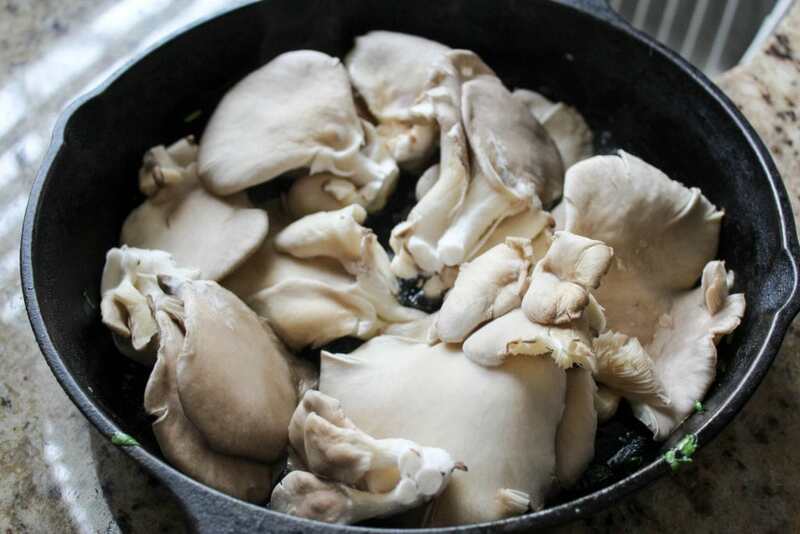 You need a big mountain of oyster mushrooms, so wait for them to go on sale. You could OF COURSE make this with other mushrooms, just without the dumb play on words. 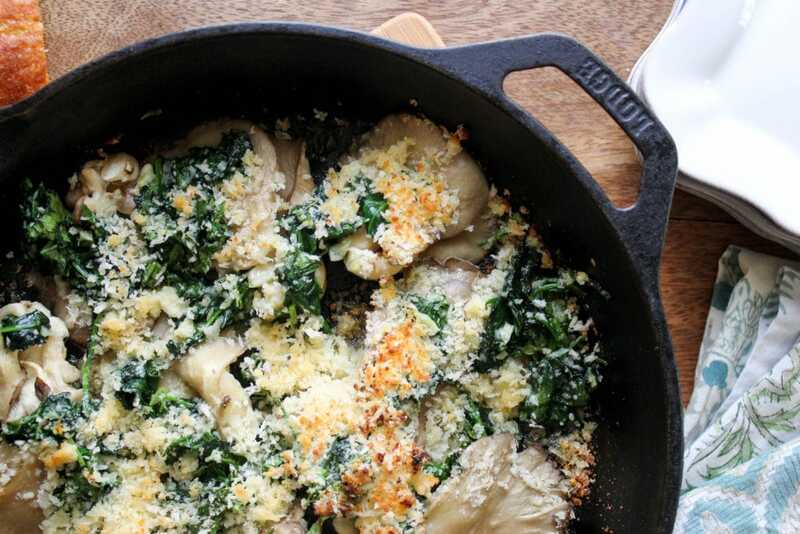 You also need butter, garlic, spinach, parsley, bread crumbs, parmesan, and salt. You could def play this up with other herbs, but I wanted a really simple flavor profile so the mushrooms would be the main flavor. First, preheat the oven to 400F and melt half the butter. 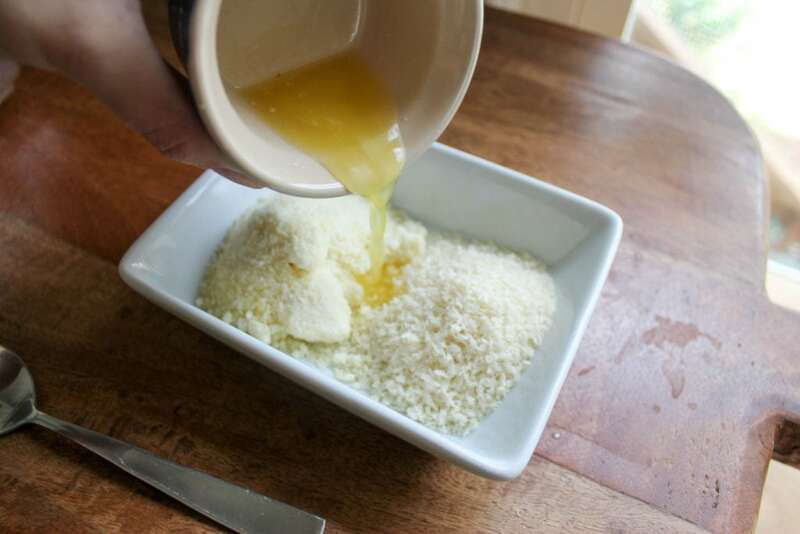 Pour the butter into the bread crumbs and parmesan and stir them gently together with a fork. 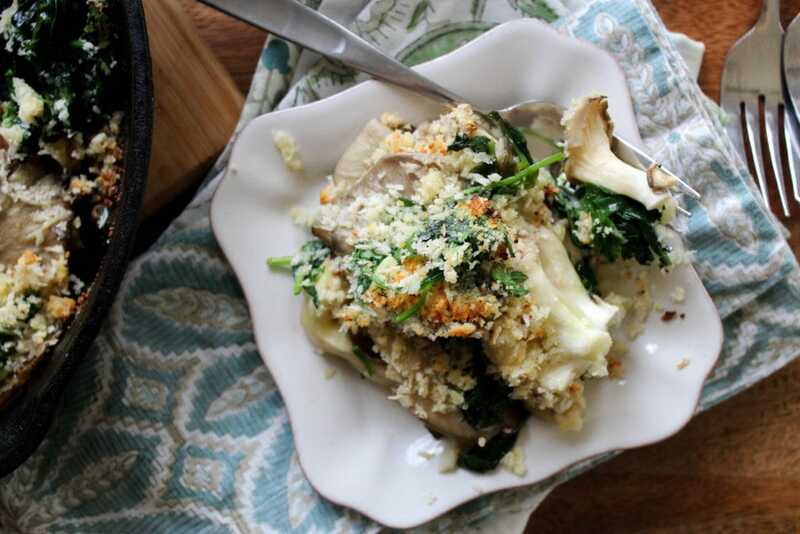 Set this aside for later – it tops the dish before we bake it. Then, in a skillet that can go in the oven (you can do the transfer to baking dish method, or just get a cast iron skillet. Or use a regular skillet! They can almost all go in the oven up to 450F or so, Google it. ), melt another bit of the butter over medium heat and add the garlic. Let the garlic cook for just one minute, then add the spinach. Sprinkle the dish lightly with salt. 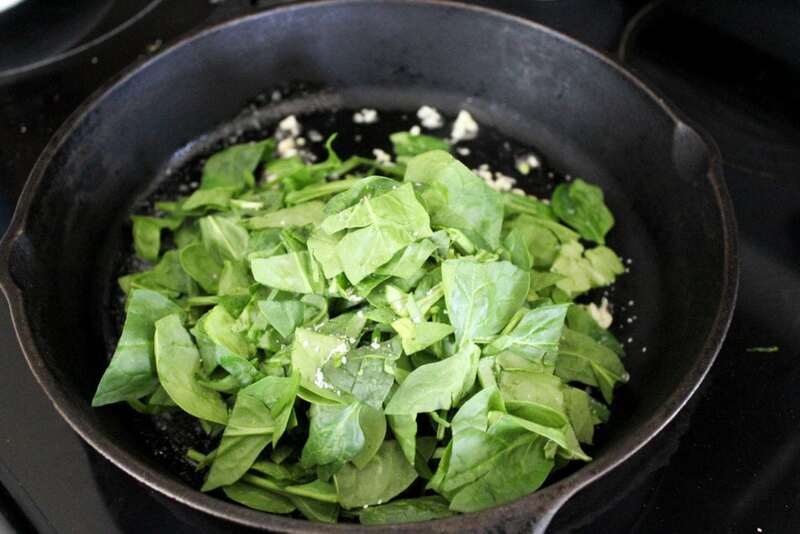 Cook the spinach for 1-2 minutes until it starts to wilt, then turn the heat off the skillet and stir in the parsley. Transfer the whole dish to a plate to hang. This is the same plate we started with – look how much the spinach cooks down. Now, add the last little bit of the butter to the skillet (still hot, but off) to melt, then arrange the mushrooms in the skillet in one even layer. They can overlap some; they’ll cook down a lot in the oven. Sprinkle the mushrooms with salt. 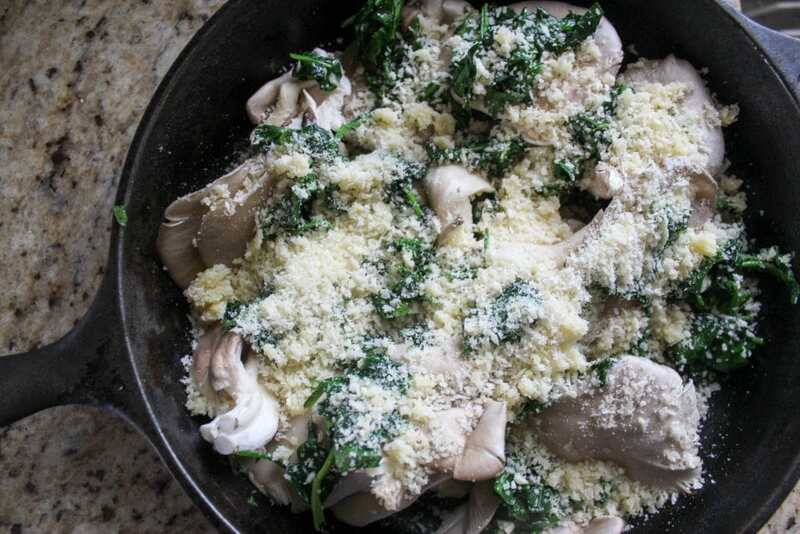 Spoon the spinach mixture into the skillet over the oyster mushrooms, then sprinkle everything with the breadcrumb mixture. 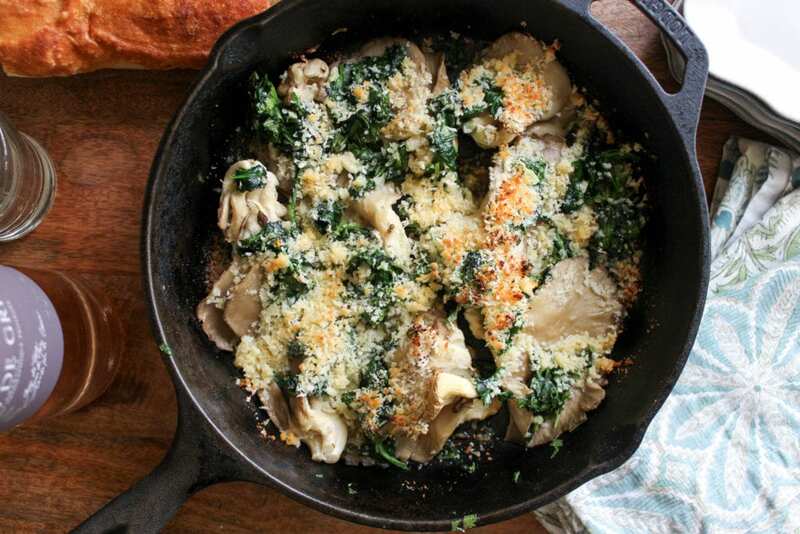 Bake the dish for 10-15 minutes (depending on your oven and skillet), until the mushrooms are soft and toasty at the edges and the breadcrumbs are toasted. Like I said, this can be used for so many parts of your meal, and I’m not joking when I said that Jay and I had half of this skillet each with some chicken and called it dinner. It’s got 2 veggies in it, after all, and the parmesan breadcrumb mixture doesn’t hurt a dang thing. For the vegetarians and dirt-averse in your life, here you go! Preheat the oven to 400F. Separate the butter into 3 equal parts. 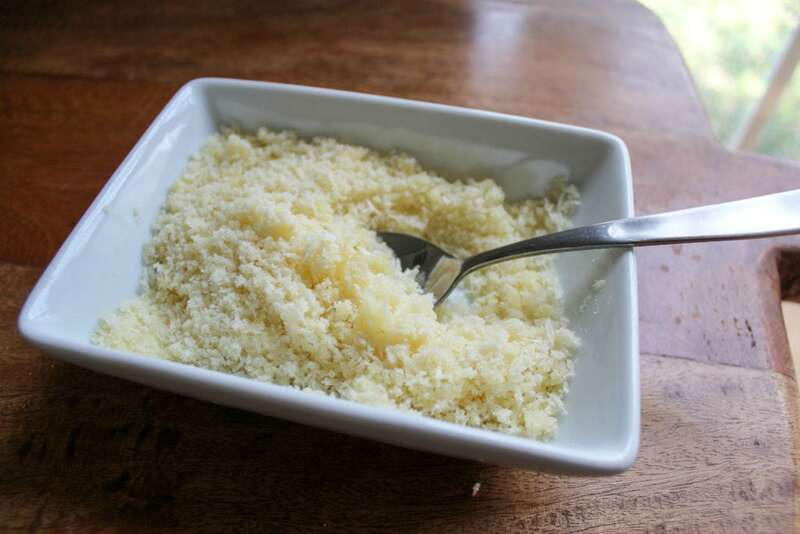 Melt 1 tablespoon of the butter and combine it gently with the breadcrumbs and parmesan cheese. Set the mixture aside. 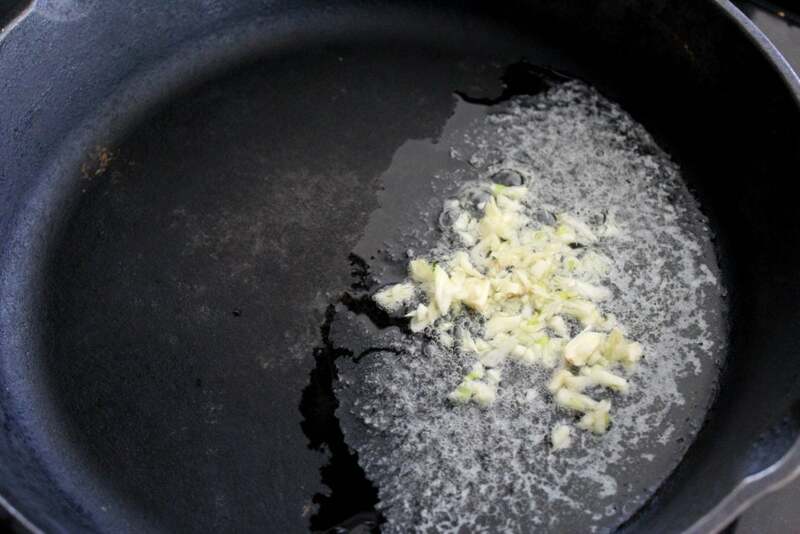 In an ovenproof skillet (8-10 inches), heat 1 tablespoon of the butter with the garlic over medium heat. 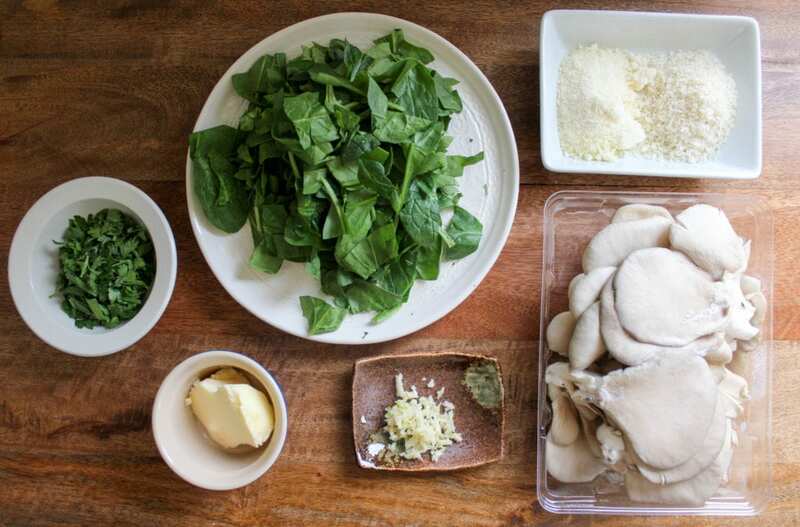 When the butter melts, cook the garlic for 1 minute, then add the spinach with a sprinkle of salt. 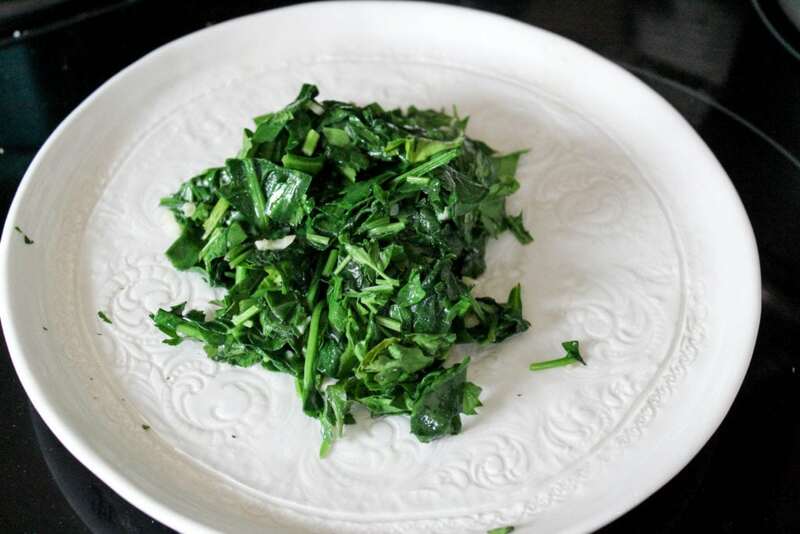 Stir the spinach to wilt for 1-2 minutes, then stir in the parsley and remove the mixture to a plate to rest. Turn the heat off the skillet and add the last tablespoon of butter. 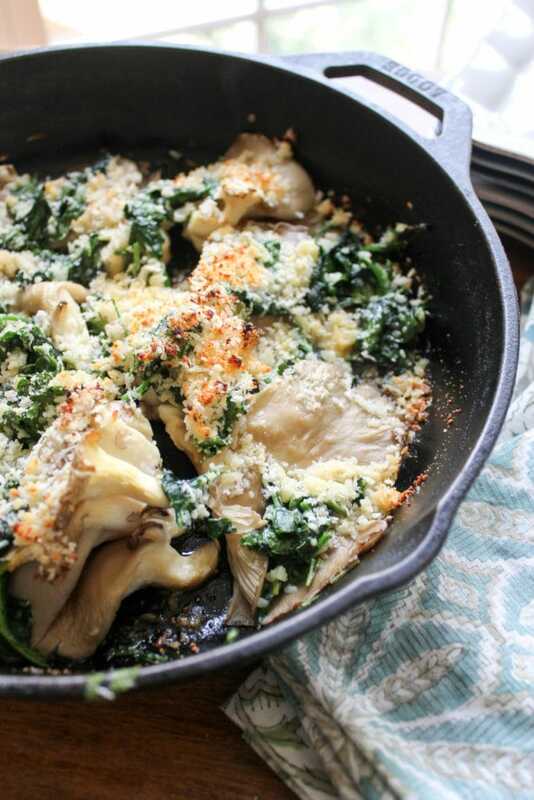 When the butter melts and coats the bottom of the skillet, add the mushrooms in one even layer. 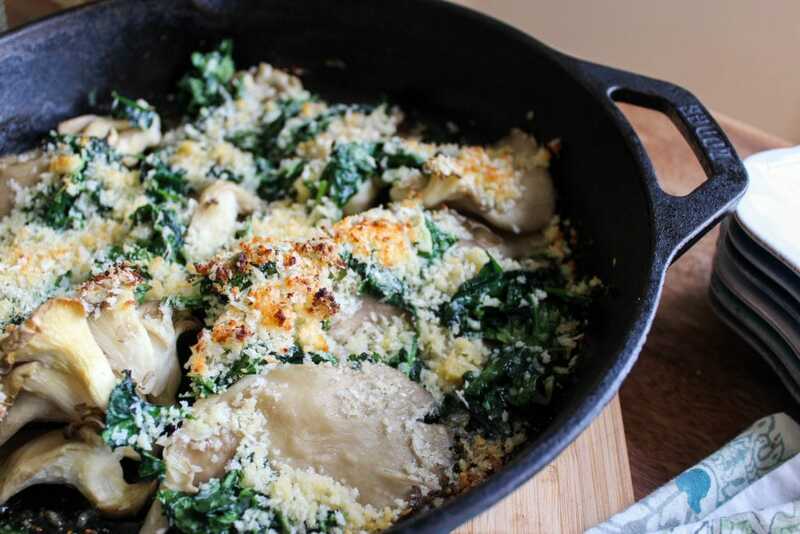 Spoon the spinach mixture on top and sprinkle the breadcrumbs over the whole skillet. Bake at 400F for 10-15 minutes, until the mushrooms are wilted and the breadcrumbs have browned. Serve warm as a side dish or over bread as crostini.